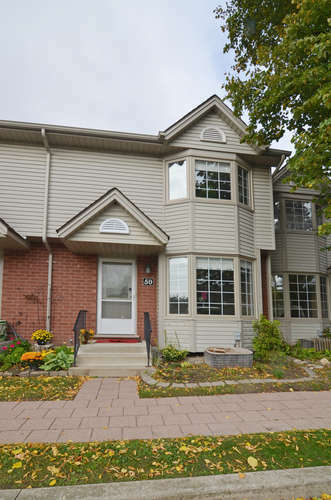 Welcome to #50-50 Chapman Court, a 2 storey, 3 bedroom condo in a popular Northwest London neighbourhood at the corner of Wonderland Rd North and Sarnia Rd. There are two assigned parking spaces; something not commonly found in condo complexes. London transit gives you easy access to Western University, University Hospital, and downtown London. The food stores; Angelo’s, Farm Boy, Costco and Food Basics are within walking distance or a very short bus ride away. Super floor plan with large eat-in kitchen, garden doors leading to a west facing, private rear deck that in a great place to enjoy a quiet cup of tea. Both living room and master bedroom have a bright bay window. The basement has a recroom and lots of room to store your off-season possessions. Contact David Aspinall, Sales Representative, Vision Network Real Estate Ltd.